Making cake with chocolate mousse filling takes a simple, classic dessert and turns it into a gourmet creation. Depending on how much time you have to put into your dessert, you can make the process simple or complex. The easiest option for baking a cake is to utilize a cake mix and bake it in two, 9-inch layers. Many cake mixes yield moist, flavorful desserts. Try devil's food, white cake, sour cream cake or yellow cake, all of which pair well with chocolate mousse filling. Alternatively, bake your own cake and add the filling. Grease two 8-inch spring form pans and "flour" them with cocoa powder. Melt chocolate and butter in a double boiler, stirring until melted and smooth. Remove from heat and stir in remaining ingredients until well-combined. Pour into spring form pans. Allow to cool for 25 minutes, release from pans and set on a wire rack. Chill a bowl and whisk in the freezer for a few hours. Melt the chocolate chips over a double boiler until smooth. In the chilled bowl, whip the cream and sugar until it holds its shape. Fold half of the cream into the chocolate until incorporated. Fold the chocolate and cream mixture into the remaining whipped cream, incorporating thoroughly. Spread between the two layers of flourless cake. 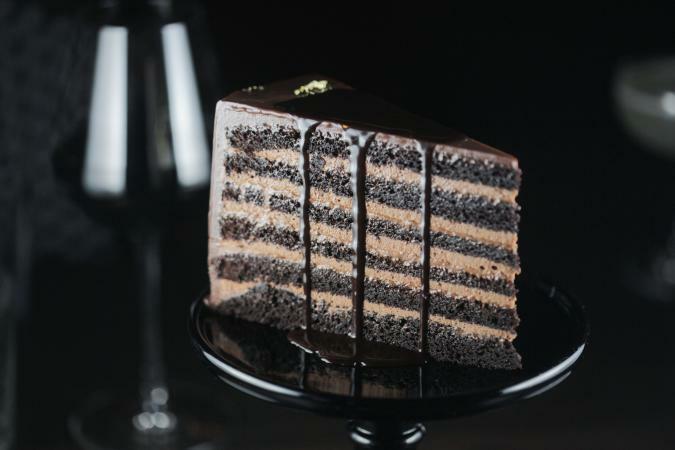 Leave the cake just as it is, or increase the richness with a chocolate icing. Try a simple ganache, which imparts rich flavor and a glossy finish. Place chocolate in a bowl. Heat cream over low heat, stirring occasionally, until it starts to simmer. Pour the cream over the chocolate and stir until well-incorporated. Pour warm ganache over the cake or, if you prefer a spreadable frosting, allow it to cool to room temperature and spread on the cake. Garnish isn't necessary, but it adds a nice finished look to your cake. Garnish with white chocolate, chocolate curls or shavings. Ensure your cake is a success every time. The cake is perishable; store in the refrigerator if you won't be serving it right away. Serve with a side of raspberry sauce. Consider flavoring your mousse or ganache with flavored oils like raspberry or orange. For another decoration, cut a template out of parchment paper. Place the parchment lightly on the iced cake and sift powdered sugar or cocoa powder over the cake to create a design. Regardless of your level of skill in the kitchen or the time you have available to cook, you can make a beautiful gourmet cake filled with creamy mousse. Give cake with chocolate mousse filling a try; you're sure to impress your friends and family.